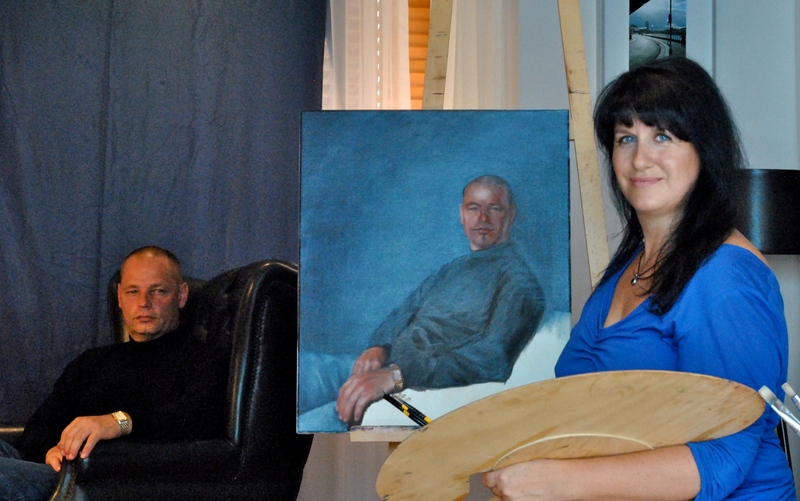 Portraits can be painted from life, from photographs or a combination of both. I can employ any of these methods but with today’s time constraints most people prefer to just sit for the one or two photo shoots taking 2-3 hours and then send me back to the studio to do the work. Prior to the photo shoot I ask the subject to think about how they would like to be portrayed. This includes the size of the painting, body position (eg standing, sitting ), hand positions, clothing etc. At the photoshoot we try different clothing, postures, lighting and background and choose the images the sitter and their family think look the best and most truly show the usual “look” of the subject. When painting in oils I only use the best Italian or Belgian linen and the finest oil paints. These paintings are designed to endure for many years, an heirloom which can be handed down through generations. For interstate and overseas commissions, travel and accommodation expenses will attract an extra fee. Sarah Sheridan, Sydney Morning Herald – 12 January 2006.